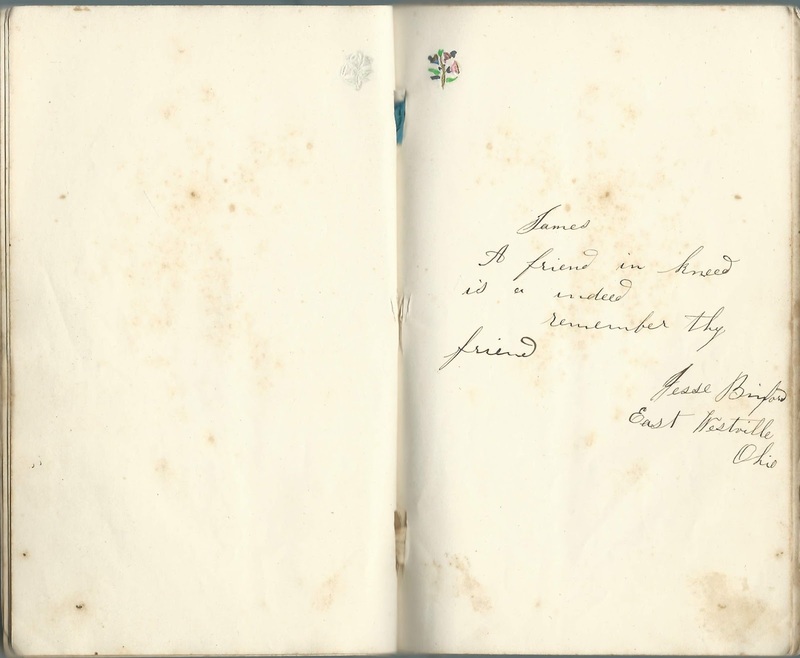 Autograph album started in 1853 by James S. Pegg of Bloomingsport, Indiana, a student at Friends Boarding School in Richmond, Indiana. Friends Boarding School, established in 1847, changed its name to Earlham College in 1859. Perhaps Bloomingsport is place now known as Bloomingport, Indiana. 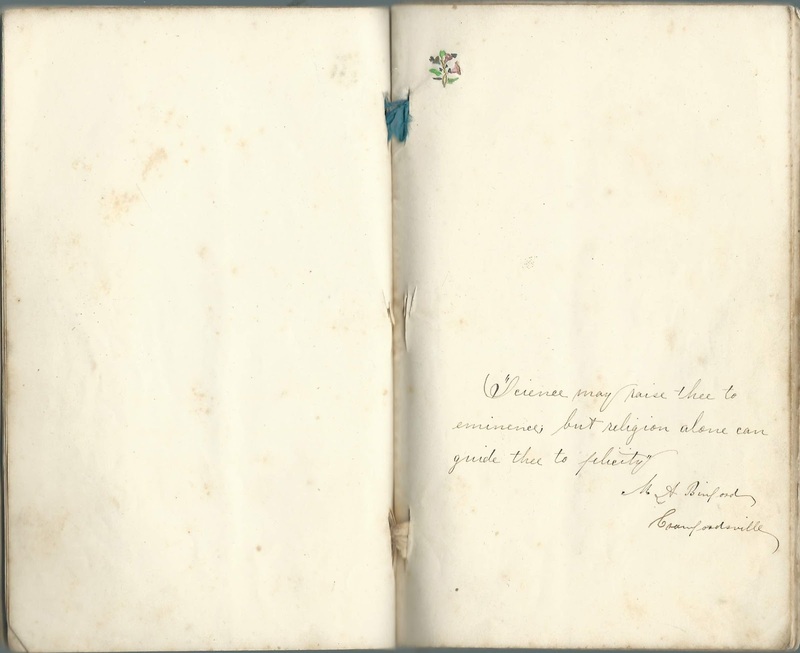 The homemade album measures approximately 6-1/2" by 4" and is missing its back cover and perhaps one or more inscribed pages. 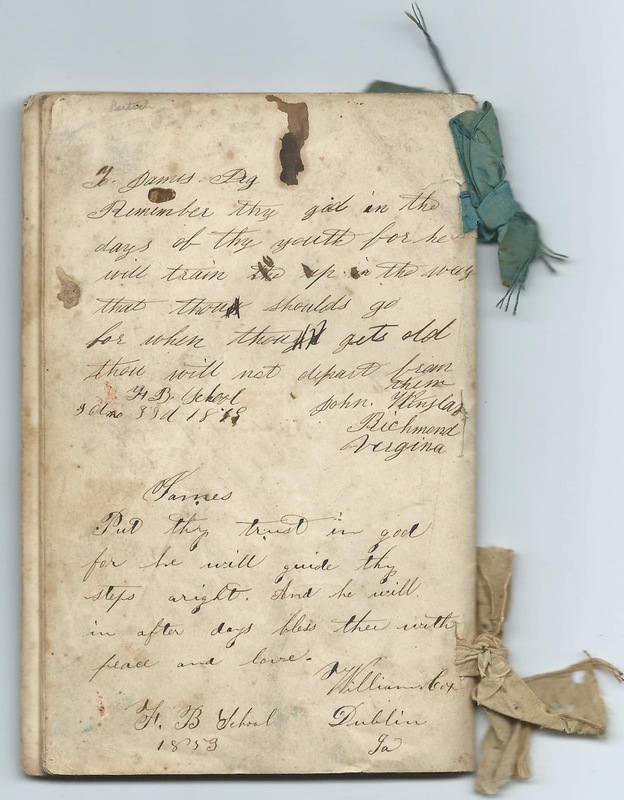 An alphabetical surname list appears below and an alphabetical list of the inscribers, together with any personal information they offered, appears at the end of this post. James S. Pegg was born April 24, 1836, or April 24, 1837, in Indiana, the son of David and Jane (possibly Sanders) Pegg. I found Quaker records for each birth year. 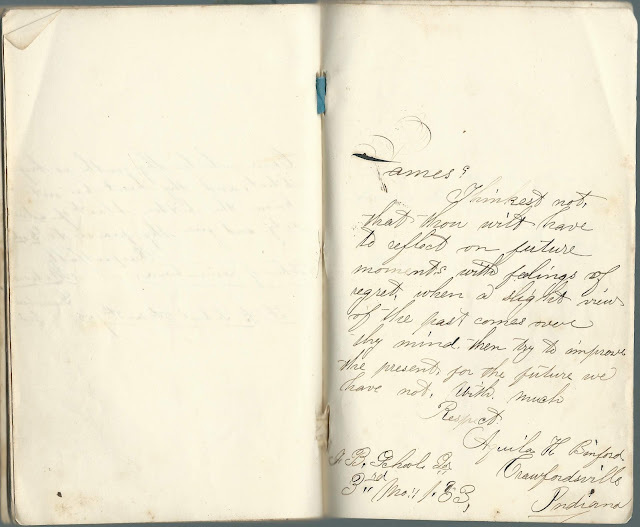 Both parents had connections to North Carolina; read more on the migration of Quakers from North Carolina to Indiana here. James S. Pegg is buried in the New Garden Friends Cemetery in Wayne County, Indiana, with his parents and sister. 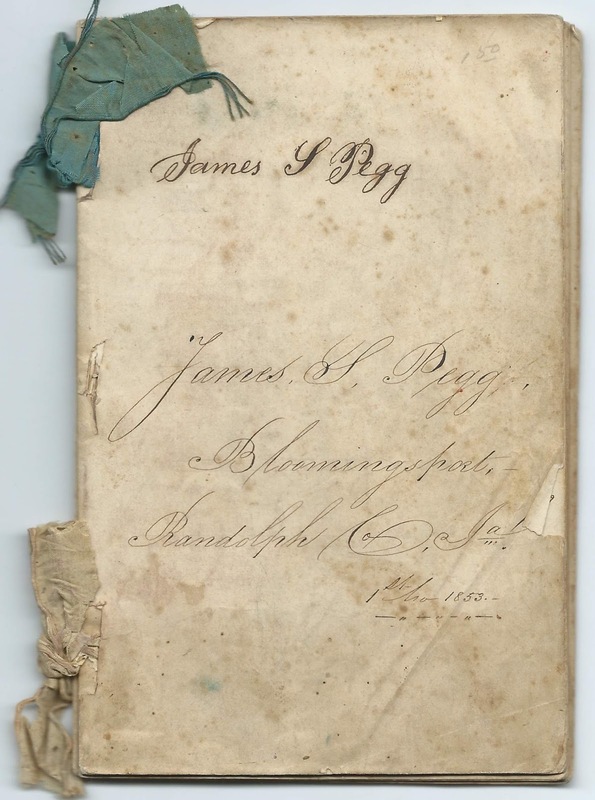 I don't know if this particular James S. Pegg ever married or had children. Hopefully a reader will share information in the comments. If you have information to share on any of the people mentioned or on Friends Boarding School/Earlham College, please leave a comment or contact me directly. Elizabeth R. Branson; inscribed at Chester, possibly Chester, Indiana, on the 20th of the 3rd month of 1853. Allen Hill of Carthage, Indiana; inscribed at Friends Boarding School at Richmond, Indiana, on the 24th of the 3rd month of 1853. James Patterson of Carthage, Pennsylvania; inscribed at Friends Boarding School at Richmond, Indiana, on the 22nd day of the 3rd month of 1853. 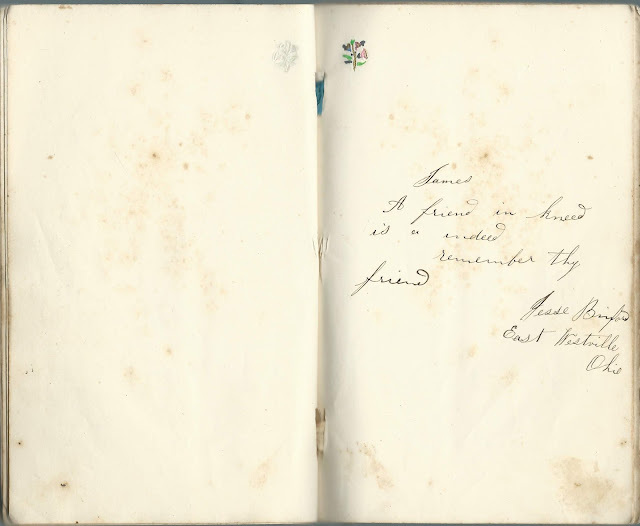 David Pritchard of Raysville, Indiana; not sure of middle initial, possibly P.
Vierling K. Stanley of ? 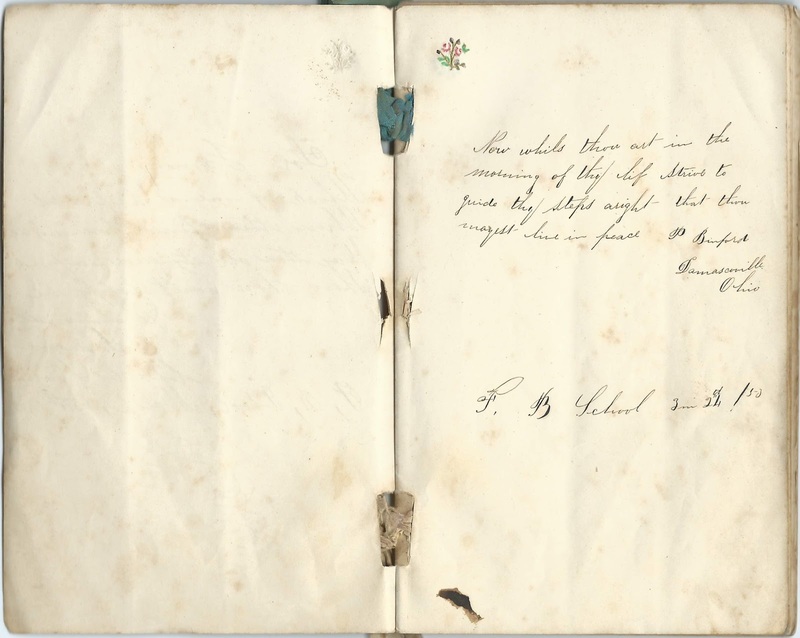 Indiana, possibly Speerland; inscribed at Friends Boarding School at Richmond, Indiana, in the 3rd month of 1853.